What a beautiful sight as the cruise ship pulls into dock! Juneau, Alaska sets at the foot of Mt. 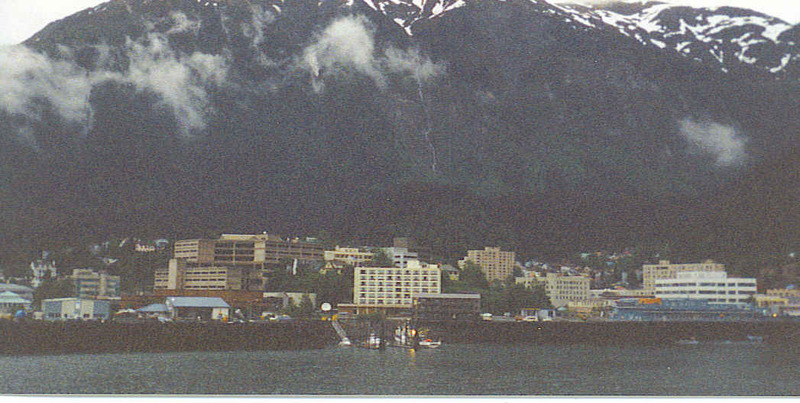 Juneau, which is about 3,500 feet high making for a beautiful backdrop for the city. This capital city is the only US capital that has international borders, as it edges up to the Canadian province of British Columbia. In 1880, Joe Juneau and Richard Harris searched for gold with the help of Indian guides. They found nuggets as “large as beans” and from their discovery came three of the largest gold mines in the world. By the end of WWII, more than $150 milllion in gold had been mined. Eventually the mines closed, but the town named for Joe Juneau in time became the capital of Alaska. Breathtakingly beautiful glaciers are one of the big attractions as the ship docks early in the morning. As soon as we have a quick breakfast, it is off to a bus which takes us to the TEMSCO Helicopter site. First, we have to get weighed as the helicopter must be balanced for safe flight. Then everyone is issued ice boots with cleats on the bottom for our walk on the glacier. Ready to lift off and see some of the most beautiful scenery imaginable. The helicopter flies low over the glacier and we get some awesome views. We get an eagle’s eye view of ice spires, deep blue crevasses and meltwater pools. This is just fantastic! 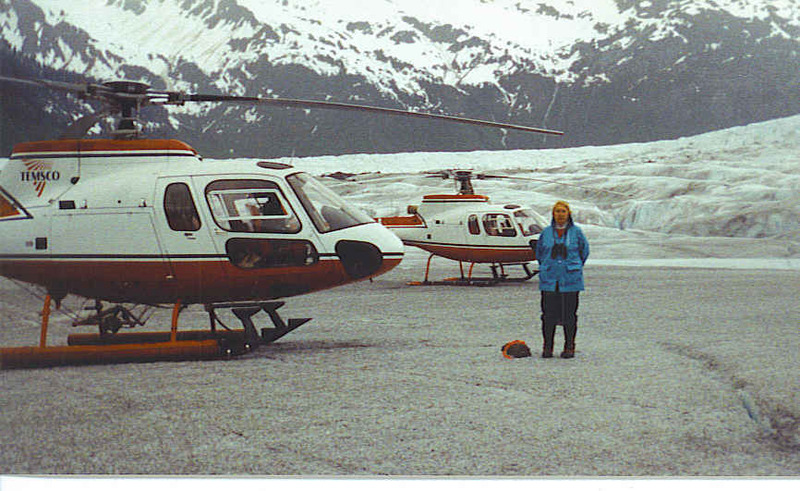 After about 15 minutes, the helicopter lowers itself onto the ice and we are told to step out of the helicopter onto the Mendenhall Glacier. What a thrill to actually be setting foot on a real glacier. Explicit instructions are given to stay away from the crevices and to not venture far from the aircraft. The pilot keeps a close eye on everyone. Went perhaps a little far myself as just couldn’t resist looking down in one of those crevices. The pilot shouted,” Get back from the edge. If you fell in you would never be heard from again. That goes down for thousands of feet.” So did quickly move away from the deep, deep crevice and continued walking on the ice. 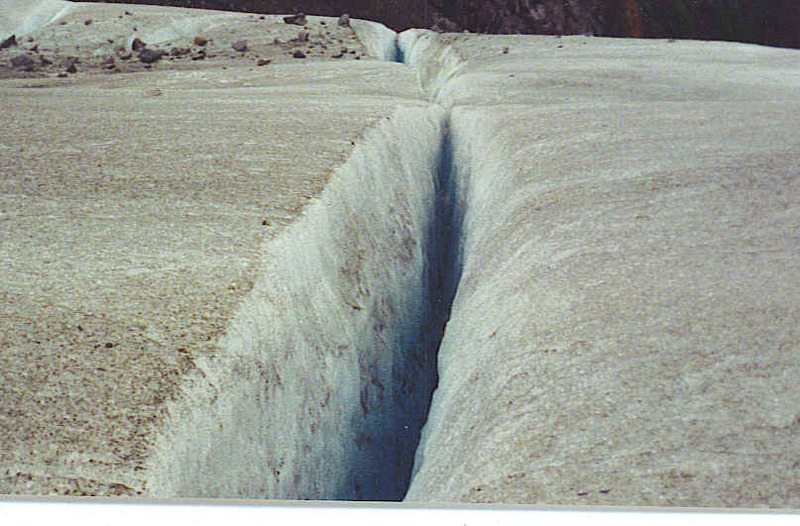 One thing for sure, you never want to walk backwards on a glacier. This walk on the glacier was perhaps the highlight of my Alaskan vacation. Just to know you were on a massive, moving block of ice, that was created long before our existence, was a thrilling experience. Back in town experienced a nice walking tour of parts of the city after an overall bus tour. 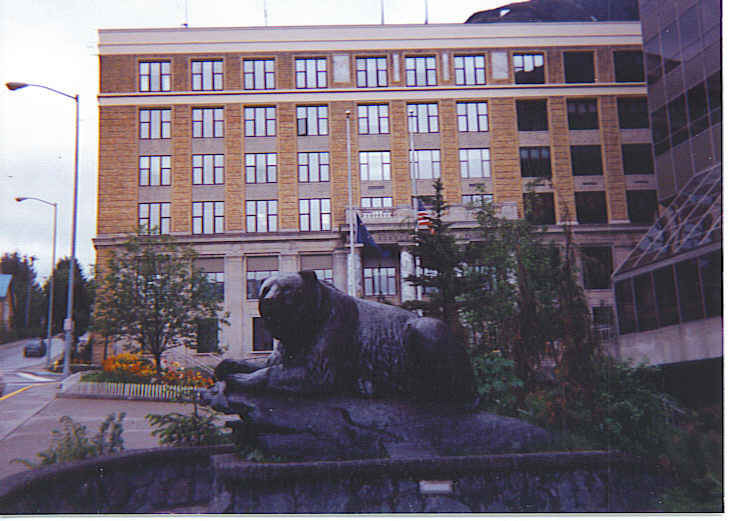 The Alaska State House was built in 1931, originally called the Federal and Territorial Building. When Alaska became a state in 1959, this then became the capitol building. The bronze bear in front of the capitol seems to be the perfect statue for this setting. 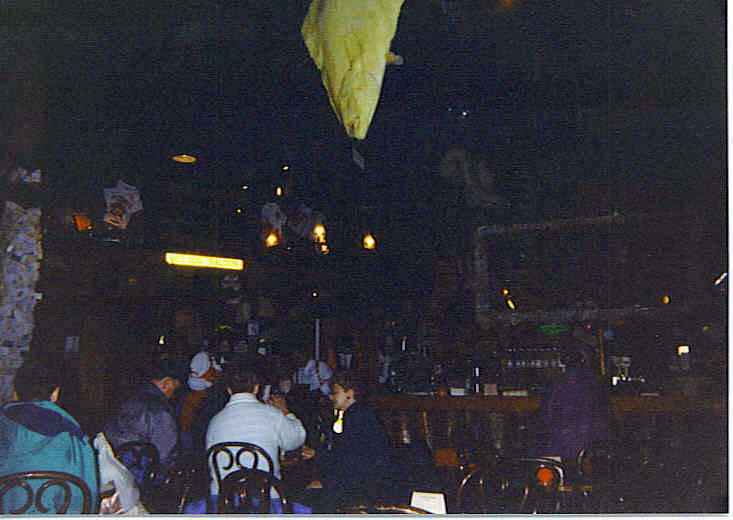 Along the way, stops are made at the World Famous Red Dog Saloon, the hangout of the goldminers. Took time for a great hamburger and had to have some peanuts, as part of the ambience of the place is the fact that the floor is covered with peanut shells. Wherever you have a saloon, you usually find a church in the area also. 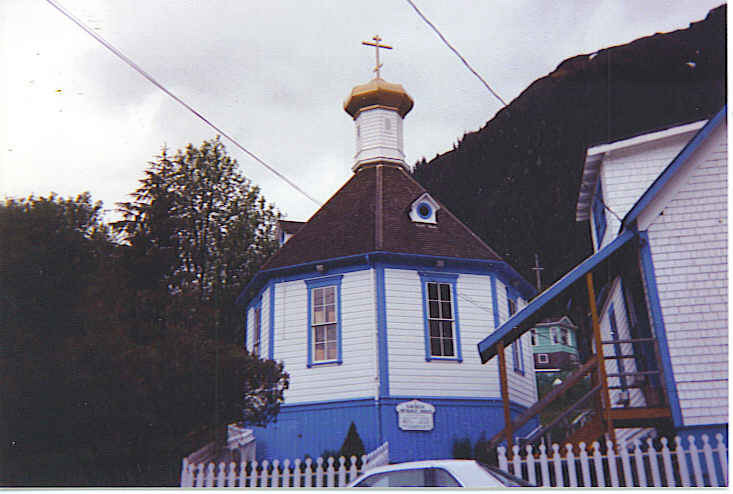 Nearby is the beautiful St Nicholas Russian Orthodox Church, the oldest church in Alaska. Since my family grew up in the Orthodox tradition, took time to light some candles in their memory. The dome of this church is covered with gold leaves, a reminder of the gold rush years. What a fun day in Juneau. This town could have a repeat trip sometime in the future as there are many interesting places time did not permit visiting. The air is filled with a light mist but that doesn’t dampen the spirits of visitor to this exciting city.